Malaria goes with feverish symptoms. Headache, cold, and in ability to eat. Rear among the symptom is mental disorder popularly calld cerebral malaria which is flushed away with quinine. Malaria is commonly treated with Chloroquine or Artesunate. But cerebral malaria is normally treated with quinine. 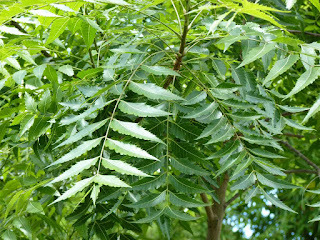 Quinine is also found in tonic drink. But the last time I checked, the side effect of quinine is very enormous. Effects like headache, ringing in the ears, trouble seeing, and sweating. More severe side effects include deafness, low blood platelets, and an irregular heartbeat. Quinine although was synthesis from a tree the bark of the cinchona (quina-quina) tree and the WHO warns against the use of quinine. it should only be used when artesunate is not seen. Cerebral malaria is the most severe neurological complication of infection with Plasmodium falciparum malaria which is resistant to chloroquine and artesunate so quinine remains the only remedy for the disease. But their is a cheaper and easier way to treating cerebral malaria using dogonyaro, awopa (Enantia chlorantha ) and lime. I would just share a story and rap up this post. Nigeria has a special way of handing mental illness. 95% of Nigerian with a mentally ill patient would result in exorcism compare to seeing a psychiatrist. The stigma behind talking your patient to a psychiatric hospital would discourage a lot of persons. So back to the story, we were called from the school of a little girl who happened to be my neighbour. The message her sister got was "Could your come over, your little girl would use some help". So I jumped into my car with her sister and we were directed to see the school counsellor who told us to take the little girl to church that she's possessed of some stubborn demons. unfortunate for her, they took to the advise and never took the girl to the hospital. Her parent was out of the country and they refused to tell the girls parent. In a nutshell, are parent got to know and discovered it was just cerebral malaria. Then I got to discover dogoynaro and awopa. Though the doctors did a good job in their medication. But the alternative medicine was also found useful. There is a kidney campaign against using such herbs in Nigeria. But it taste really good like a tonic drink. I wish you get the one I take close to my neighbourhood. It is made with a little alcohol (Locally made Gin from palm wine. It is commonly called Ijaw), freshly squeezed lime and a special technique of mixing the herbs together in accurate proportion.